Interchangeable lever heads help you create a custom configuration of throttle, flaps, mixture, and prop pitch. Remove the lever tops and then group the controls just how you want them. Logitech G Throttle Quadrant is equipped with adaptable mounting clamps which provide the freedom to configure your kit in any manner you see fit. 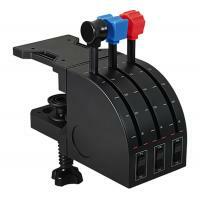 Whether on top of your desk or clamped to the front, you can securely place the controls exactly where you want them. The Logitech G range of instruments can be situated one on top of another or side-by-side. Want the Radio Panel above the Multi Panel? Done. Want your Switch Panel to the left of your Yoke? Go for it. Easy-to-use mounting brackets provide the means to arrange your flight simulation setup in a configuration only limited by your imagination. No need to load drivers or install extra software. Pro Flight works with Windows 7, 8.1 and 10 and is compatible with your favorite flight simulation software for PCs including FSX - Flight Simulator X, X-Plane 10, and Prepar3D® 2.2.